The door – designed by Ales Lombergar, glass designer -has been specifically produced with the Gulf market in mind, says Alen Tibljas, general manager. 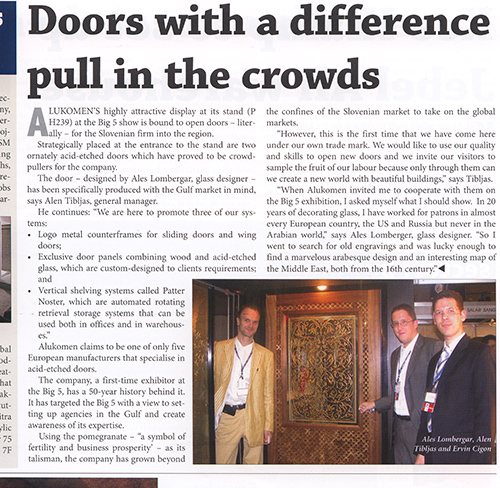 Alukomen claims to be one of only five European manufacturers that specialise in acid-etched doors. The company, a first-time exhibitor at the Big 5, has a 50-year history behind it. It has targeted the Big 5 with a view to setting up agencies in the Gulf and create awareness of its expertise. Using the pomegranate – “a symbol of fertility and business prosperity” – as its talisman, the company has grown beyond the confines of the Slovenian market to take on the global markets. “However, this is the first time that we have come here under our own trade mark. We would like to use our quality and skills to open new doors and we invite our visitors to sample the fruit of our labour because only through them can we create a new world with beautiful buildings,” says Tibljas. whoah this blog is great i love reading your posts. Keep up the good paintings! You realize, a lot of persons are hunting round for this information, you can aid them greatly. My wife and i have been now contented that Albert managed to finish off his investigation with the precious recommendations he made through your weblog. It’s not at all simplistic just to find yourself offering key points which some people may have been selling. And we all see we have the blog owner to be grateful to for that. The most important illustrations you have made, the straightforward web site menu, the relationships you make it easier to foster – it’s all fabulous, and it is helping our son and our family feel that this issue is amusing, which is very fundamental. Thank you for the whole thing! How was stephen glass characterizedin the media when his fabrications wereexpossedin 1998? How do you remove a sticky substance from a glass surface? Does anyone know the brand name of antique glass with a “diamond with an “H” embossed on the bottom? How do they etch the inside of glass? A scale is balanced with a partially filled glass of water on one side.? Do you think drinking one glass of an alcoholic beverage is a sin? Does anyone know of any glass blowing classes in North Carolina, more specifically Boone.? Can broken glass sink into the ground? Collector question what does a flower stamped on a carnival glass bottom? I? Sites to purchase nice cross necklaces maybe with a name engraving?